Providing you the best range of corrosion inhibitor and corrosion inhibitor for crude oil with effective & timely delivery. We are the manufacturer and exporter of Corrosion Inhibitor.We have wide experience in the product field of Corrosion Inhibitor.Avail from us Corrosion Inhibitor a free flowing homogenous liquid. 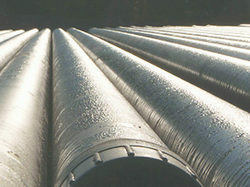 We offer the Corrosion Inhibitor packed in HDPE Barrel. Utmost care is taken to manufacture the Corrosion Inhibitor keeping the safety aspect in view. Conforming to the market standards we offer the Corrosion Inhibitor at leading price within a pre-determined time frame. We are the manufacturer and exporter of wide range of high quality Corrosion Inhibitor for Crude Oil. These Corrosion Inhibitor for Crude Oil products are available at affordable market price and manufactured using high quality raw material. These Corrosion Inhibitor for Crude Oil products enhances the efficiency of crude oil by decreasing the corrosion rate. These Corrosion Inhibitor for Crude Oil products are tested at various parameters to ensure superior quality and flawless performances. We also cater the export order worldwide.